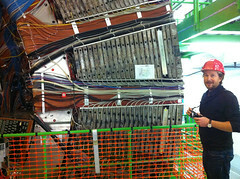 Craig recounts the time we visited the LHCb at CERN. It’s a lovely bit of writing. I wish it were on his own website. I remember when Mark took me aside to tell me about the project he was working on with CERN to restore the first ever website to its original URL. Needless to say, I was extremely pleased. After all, cool URIs don’t change. Then, more recently, Mark told me about a follow-up project they were planning: to recreate the experience of using one of the first web browsers. 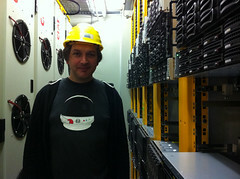 He asked if I could help organise a hackday-style gathering to accomplish this. I jumped at the chance. 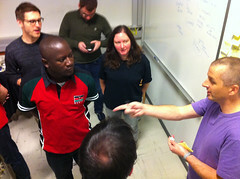 Together with Dan Noyes from the web team at CERN, we assembled a dozen people. Half of them were invited experts and half were chosen from applications. Because I was ostensibly involved in organising the event (although I didn’t really do much), I got a free pass. 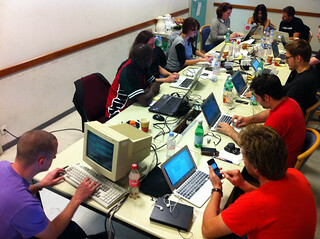 And so we gathered in a war-room at CERN on the 18th and 19th of September to hack away at recreating the experience of using the line-mode browser in a modern browser—browserception! Just being at CERN was amazing. It’s like double Disneyland for me: not only is it home to the greatest experiment conducted in the history of our species, it’s also the birthplace of the web itself. We all felt quite humbled to be there. 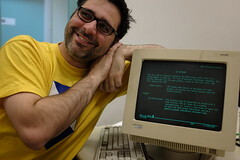 We had another guest from the early days of the web with us for the duration of our hacking: an IBM RS/6000 machine from the early nineties running the line-mode browser. 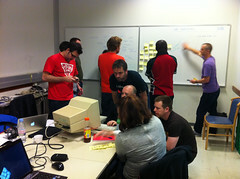 I drew on my experience from hack farm and Science Hack Day to get the ball rolling. I was acutely aware that some of us felt pretty unsure about what we could contribute, so I suggested splitting into two teams: one to work on building the line-mode browser simulator, and the other to work on telling the story of its history. That seemed to work out pretty well. 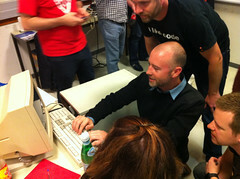 Remy and Brian L. did the really hard work, implementing a simulation of the line-mode browser in Node.js. Lea, Kimberly and John made sure the output looked and felt right. 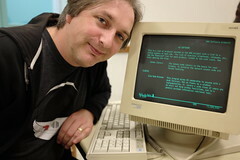 Meanwhile Brian S. had the crazy idea of trying to recreate the font from the IBM machine …by taking a photo of the screen and drawing the glyphs from the photo! Of course Mark jumped on that. Craig headed up the story-telling side of things with Martin and Angela. 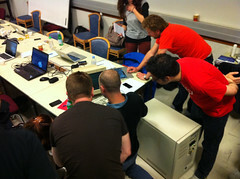 My contribution consisted of writing some explanatory words and doing a bit of image optimisation. It would be easy to feel inadequate in the company of such talented developers, but as the hacking went on, it was clear that all those little contributions really add up. 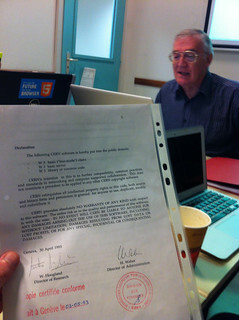 It will probably move from its current URL—line-mode.cern.ch—to a permanent home. In the meantime, why not grab the code and install a copy locally? Clone the github repo to your machine. 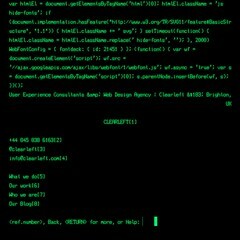 Open up the Terminal, navigate to your cloned copy, and type: node . Open localhost:8000 in a browser. You can also grab a bookmarklet from the resources page. Drag it to your bookmarks bar, pull up whatever page you want to view, and hit the bookmarklet to see it line-mode style. 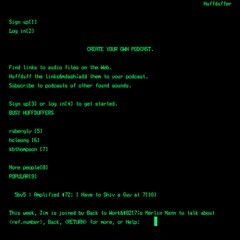 All the little details—the font, the animation, the sound—add up to an experience that I find quite immersive. In some ways, it’s a silly little project, but it’s also trying to convey an important message. I really love the final result. I feel incredibly honoured to have been involved—in a small way—in its creation. 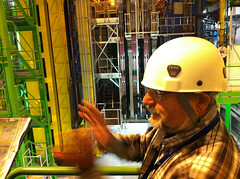 Oh, and we also got to go down into the heart of the Large Hadron Collider to see the LHCb experiment. That was, in the truest sense of the word, awesome. 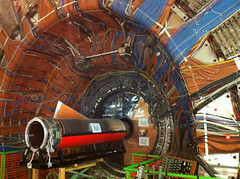 James geeks out about visiting CERN. His enthusiasm is infectious.